Sync Outlook with iPhone with Microsoft Office 365. Sync Outlook with Android with Microsoft Office 365. 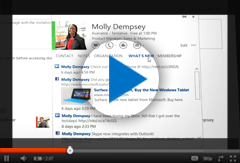 Share Outlook with Microsoft Office 365. Share Outlook Contacts without additional software. Try out brand new Microsoft Office 2013 with new features brought to the Cloud. Buy Microsoft Office: new pricing and additional productivity features. Hosted Microsoft Exchange Online- much simpler management and maintenance for a lower price.